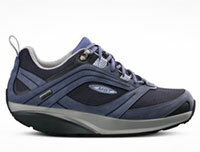 The Chakula is the shoe in the MBT® range designed specifically for the outdoors user. As such it has a Goretex® lining and the trademark curved sole has been enhanced by the addition of the IceLock™ and Hypergrip®, technologies developed to provide good traction on dry, wet or icy surfaces. By way of background, MBT® (or Masai Barefoot Technology) are a Swiss company who have been selling their very distinctive shoes since 1996. All MBT® shoes are designed with a curved sole which, so the theory goes, preserves the foot's natural roll and also introduces a sideways instability. These two features are claimed to improve balance and posture plus - because your muscles try to correct the 'instability' - provide an extra workout for your leg muscles. Footwear in the MBT® range is rated according to the level of instability experienced in use: Activate (least unstable), Dynamic, Performance, Ultimate (the most extreme level). The rating is an indicator only because the individual's own anatomy may also affect how the shoe feels on him/her personally. The Chakula is rated as 'Performance'. So - having gleaned all this in advance - I was really most intrigued to get out in my test pair of Chakulas. I gather that earlier versions of MBTs had a definite 'therapeutic' appearance. Current designs, though, have a much more acceptably contemporary appearance and the Chakulas are no exception. They look just like other low cut, super-trainers - aside from the sole which is definitely curved and also relatively stiff. There is also a good level of padding around the top of the shoe and the inner sole. As expected, though, when I put them on I immediately felt the impact of the sole design. I definitely needed a short while to orient myself to the rolling of my foot as I walked around. I actually felt a little 'sea-sick' on my initial try-out. (Subsequent research has revealed that this is not unknown - particularly amongst individuals with a balance problem or vertigo. I wasn't aware that I suffered from either of these conditions!). Fortunately, this initial problem did subsequently disappear. I've since worn the Chakula-s on several 9-10 mile, low level walks around some Cheshire canal towpaths, woodland and parkland. I've also tried them out on several Nordic Walking excursions. They are true to size and fit well. Certainly waterproof, they are comfortable to wear, the sole protects against sharp stones and provided decent traction on wet grass and mud. I've yet to wear them on icy/snowy surfaces. I did find, though, that the designed-in 'instability' made walking on uneven surfaces (eg cobble stones or even slightly rocky ground) a problem. As well, my calf muscles have consistently felt a little more tired than when wearing more conventional walking shoes. Overall - I like the Chakula and I'm beginning now to enjoy them more for some of my lower level walking/Nordic Walking. However, I can imagine that they may not be everyones's cup of tea. The Chakula from MBT® may really suit some for canal towpath, parkland, woodland walking, for Nordic Walking or more general outdoor leisure wear. However - walk around in them for at least 30 mins in the shop before buying them. Certainly if you have an existing back or gait problem, I would recommend that you check first with your podiatrist and/or physio.